Whether you want to soothe your skin in a saltwater pool or reduce stress in a flotation tank, we’re finding a lot of ways to sprinkle salt on your real estate. In ancient Greece, Hippocrates—widely regarded as the father of medicine —frequently used salt-based remedies to heal ailments. Today, the modern wellness world continues to recognize the healing properties of salt, which has been shown to help soothe the skin, improve circulation, and provide relief from certain respiratory symptoms. Not surprisingly, developers are now harnessing the healing properties of salt by offering everything from saltwater swimming pools to salt therapy sessions on the property. Swimming in a saltwater pool can help rejuvenate and exfoliate skin—and it can also serve as a natural moisturizer by increasing the skin’s ability to retain moisture and promoting cellular regeneration. So it makes sense that many homes, such as a Frank Lloyd Wright-inspired residence in Arizona’s Paradise Valley, come with saltwater swimming pools. 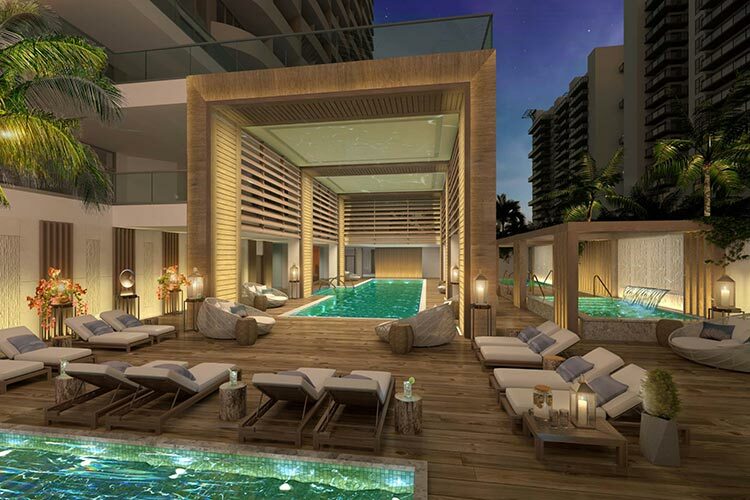 The trend is also catching on in the development world: In South Beach, Fla., the 19-unit Three Hundred Collins is outfitted with a 75-foot rooftop saltwater pool. Bedecked with white cushioned cabanas that overlook the Atlantic Ocean and downtown Miami, the rooftop lounge promises a spa-like experience. In Riviera Beach, Fla., Amrit Ocean Resort & Residences features a 40,000-square-foot indoor/outdoor hydrothermal facility with replenishment pools, an effusion shower, and a full hammam. Space also includes a salt inhalation therapy chamber, where treatments are designed to help with skin conditions such as acne and cellulite as well as relieve certain respiratory issues.